I was (rightly) admonished by Alison on Sunday while at Knitsmiths for not posting, since I am still knitting fairly regularly. It seems that it takes only the littlest thing to knock me off of my blogging game -- recently, it's been the Olympics that have been distracting me. 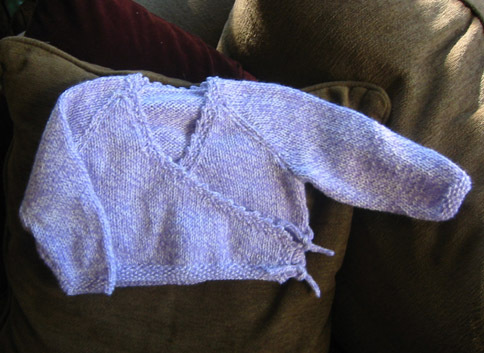 I feel like I've been knitting for baby boys at a disproportionate rate, so I was happy to hear that the next baby I'd be knitting for (a niece for Jason!) is a girl. 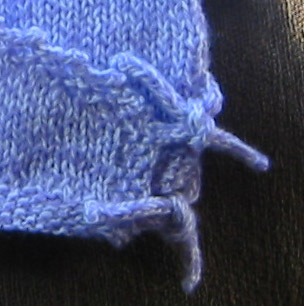 Knitting for baby girls is my Holy Grail of knitting -- fast, adorable, and likely to be well-received. It didn't take me long to find a pattern (Sirdar 1559, can you believe how cute that baby is?! ), and I was off and knitting. Everything on this sweater went fast until I added the buttons. No matter how or where I sewed them on, they pulled and puckered the fabric. I studied the pattern picture intently, and after trying all possible combinations have come to the conclusion that they must have stapled the sweater together and hot glue-gunned the buttons on afterwards. 'Cause there ain't no way those buttons are really buttoned like that. So, what to do? The answer came to me shortly -- hadn't Alison had a similar problem with a baby wrap sweater? Why yes, she did! I adopted her I-cord tie solution and it worked like a charm. That baby "cross your heart" cardi is so cute! And the i-cord tie is a great solution to the button problem. Well done! That is so cute. I love those kimono-type baby sweaters. They are so fast and fun. Very satisfying. Soooo cute! Love the little i-cords. I'm glad my solution worked for you. You must be right about the designers stapling the sweaters together. No way you can sew in a button and have it look as nice as theirs does! too cute. i just love that style. sweet details.